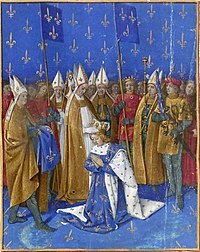 Charles VI of France (3 December 1368 – 21 October 1422), was King of France from 1380 until his death. He was not a successful king. Often he was not able to rule the country because of mental illness and his wife Queen Isabeau of Bavaria ruled with the help of his brother Louis I de Valois, Duke of Orléans. This made his cousin John the Fearless of Burgundy very angry, so John the Fearless had Louis I assassinated. A few years after that, Henry V of England invaded and won the Battle of Agincourt. Charles had a mental illness from around 1410 until he died. His mental illness involved him killing some of his own servants and at one point he thought he was made of glass. This page was last changed on 18 April 2019, at 04:27.